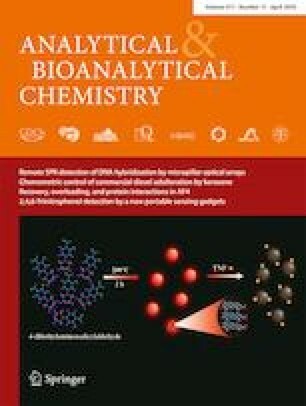 A multi-residue method was developed for the simultaneous determination of 24 plant growth regulators (PGRs) and 11 representative pesticides that were widely applied in plants used in traditional Chinese medicines (TCMs) by high-performance liquid chromatography coupled with tandem mass spectrometry (HPLC-MS/MS). The method was validated taking into consideration EU guidelines; calibration curves for all of the targeted analytes showed correlation coefficients (γ2) higher than 0.9901. The limits of detection (LOD) ranged from 0.2 to 8 μg/kg. The average recovery for all analytes in spiked samples ranged from 63.18 to 127.23%, with a relative standard deviation of ≤ 15%. The proposed method has been applied to 480 batches of TCM samples, including 34 species of medicinal plants, from the TCM market. The results showed that 14 PGRs and 5 pesticides were detected, including choline chloride, chlormequat, paclobutrazol, uniconazole, phoxim, etc. Among them, there were high detection rates for chlormequat (40%), choline chloride (100%), atonik (73.75%), abscisic acid (80.83%), and indole-3-acetic acid (41.25%). The residual level of paclobutrazol in Ophiopogonis radix exceeded the recommended maximum residue limits (MRLs) according to GB 2763–2016. In addition, 14 agrochemicals used in TCM planting were collected and detected; the result showed various PGRs were detected in samples registered as fertilizer. These results indicate that PGRs and pesticides were widely used in the cultivation of medicinal plants, especially for radix and rhizome herbs. The residue of targeted PGRs and pesticides in TCM samples from this study have a high frequency and high level. Zuliang Luo and Lixia Zhang contributed equally to this work. The online version of this article ( https://doi.org/10.1007/s00216-019-01691-8) contains supplementary material, which is available to authorized users. This work was supported by the CAMS Innovation Fund for Medical Sciences (CIFMS) (No. 2017-I2M-1-013) and Beijing Natural Science Foundation (No. 5172028). General Office of the State Council. Plan for protection and development of Chinese medicinal materials (2015–2020). 2015. http://www.gov.cn/zhengce/content/2015-04/27/content_9662.htm. Accessed 4 Oct 2018. Ministry of Health Labour and Welfare, Japan. Maximum residue limits (MRLs) list of agricultural chemicals in foods. 2006. http://www.m5.ws001.squarestart.ne.jp/foundation/search.html. Accessed 15 Oct 2018. United States Environmental Protection Agency. Index to pesticide chemical names, part 180 tolerance information for pesticide chemicals in food and feed commodities. 2009. https://www.ecfr.gov/cgi-bin/text-idx?c=ecfr&sid=1a0ecaf51aa3dba662c9cbf1b4336eaf&tpl=/ecfrbrowse/Title40/40cfr180_main_02.tpl. Accessed 15 Oct 2018. European Commission. Commission Regulation (EU) No 396/2005 of 23 February 2005 Amending Council Directive 91/414/EEC on maximum residue levels of pesticides in or on food and feed of plant and animal origin. 2005. http://ec.europa.eu/food/plant/pesticides/eu-pesticides-database/public/?event=download.MRL. Accessed 15 Oct 2018. Food and Agriculture Organization/World Health Organization. Food standards programme. Codex Alimentarius Commission. Twenty-seventh Session, Geneva, Switzerland, 28 June 03 July 2004. 2004. http://www.fao.org/fao-who-codexalimentarius/codex-texts/dbs/pestres/pesticides/en/. Accessed 15 Oct 2018. National Health and Family Planning Commission and Ministry of Agriculture of the People's Republic of China, China national food safety standard-maximum residue limits for pesticides in food (GB 2763-2016). 2016. http://www.nhfpc.gov.cn/sps/s7891/201702/ed7b47492d7a42359f839daf3f70eb4b.shtml. Accessed 15 Oct 2018. European Commission. Document no. SANTE/11813/2017, Guidance document on analytica quality control and method validation procedures for pesticides residues analysis in food and feed. 2018. https://ec.europa.eu/food/sites/food/files/plant/docs/pesticides_mrl_guidelines_wrkdoc_2017-11813.pdf. Accessed 24 Mar 2018. Xu D, Huang H, Lu M, Zhou S, Zhou Y. Simultaneous determination of 21 plant growth regulators in various fruits using QuEChERS coupled with an HPLC-MS/MS technique. 2015. https://www.agilent.com/cs/library/applications/5991-5506EN.pdf. Accessed 12 Sep 2018.